Hey Good Lookin’, What’cha Got Cookin’? The only memory from childhood that my sister and I would 100% agree on is DINNER. In middle and high school, after ‘they’ said too much red meat was bad for you, we ate grilled chicken breasts, broccoli, and a side, usually from a box. Every night. Except Friday which was pizza night. I LOVED chicken/broccoli/mac and cheese night. Second in line was chicken/broccoli/(boxed) mashed potato night. Chicken/broccoli/white rice night was okay if I could sneak enough butter into my rice. I hated chicken/broccoli/corn night- it just felt like we were getting cheated out of our boxed starch! Two vegetables- so unfair! That’s not to say my mom didn’t cook other things, but it was chicken/broccoli/boxed starch more nights than it wasn’t. 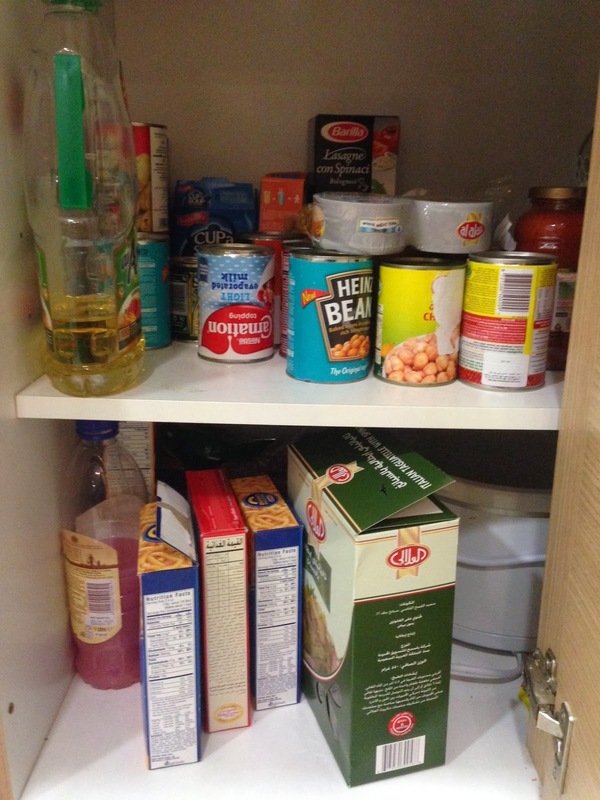 In the Dominican Republic, my pantry looked pretty much the way it had in my parents home- lots of cereals, mac and cheese (when I could find it), frozen vegetables and chicken. But I was suddenly an adult, living on my own… so the vegetables didn’t get eaten often. My first kitchen was small and awkward and I honestly don’t remember cooking more than frozen pizzas and egg and cheese bagels for breakfast. The pantry situation improved when I moved in with K the next year. She was more adventurous than me, food-wise (well, everything-wise really). There were still a lot of boxed items but we bought more fresh vegetables and fruits… that mostly K ate. I kept eating eggs, frozen pizzas, and mac and cheese. 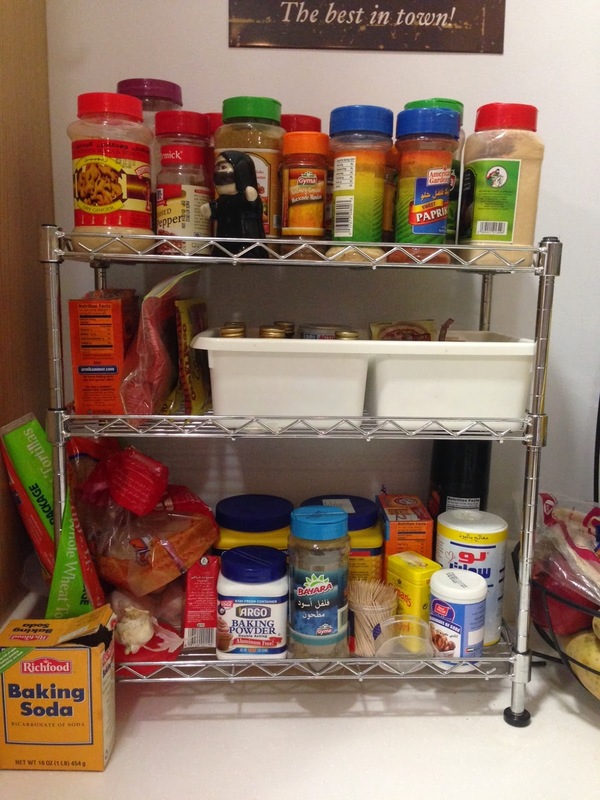 The Great Pantry Transformation really began in Kuwait, after I met the Rugby Star. He introduced me to homemade curry. He made mashed potatoes from real potatoes (whaaaaa?) and steamed fresh vegetables. He did not believe in processed cheese. Fresh french sticks were the way to go when we needed bread and sometimes, spices and herbs were good things to have on hand. I was also introduced to Middle Eastern/Lebanese foods while in Kuwait. I could almost live on things like hummus, falafel, schwarma, and kubbe if I needed to. We don’t have a true pantry in this house- we have cabinets. Since meeting the Rugby Star and having the babies, I’ve wanted to cook more ‘from scratch.’ I have baking powder and soda that I use at least once a week. The Ladybug and I have a Saturday morning pancake tradition- after trying lots of recipes, we’ve found the one the family loves and it does not involve Bisquik. I make homemade cookies and cakes. And I cook with fresh vegetables. And I use spices and herbs and I try new recipes. We’ve had grilled chicken/broccoli/starch nights in this house. And I still have a lot of boxes of mac and cheese in my pantry… but I’m okay with that. No wonder Ladybug loves cheesy pasta so much. It's a family tradition! I love the getting cheated on your boxed starch line. Hilarious. I totally blame her obsession on my own. And because cheesy pasta is so good. We might have eaten it last night. Good job, Kel! I completely concur with you…..Americans eat way too much “boxed stuff” for sure. We don't really do that either in our family–a HUGE bonus to expat living. Fresh is best! And I concur as well with your “get used to's”…..